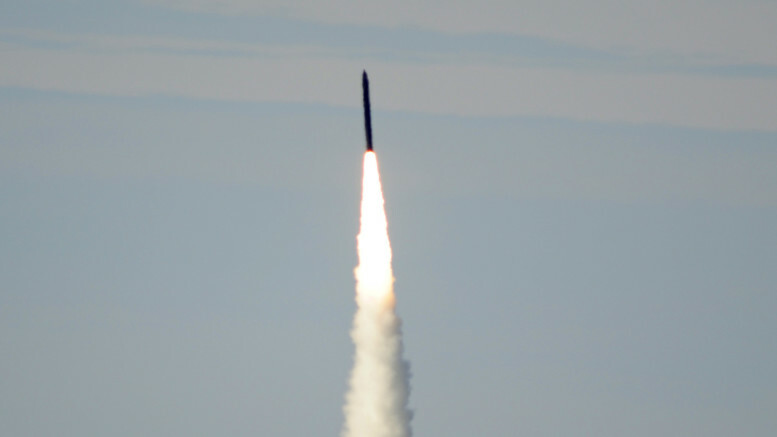 The U.S. military says a test last week of a redesigned missile interceptor rocket went well. The rocket was launched from Vandenberg Air Force Base in California on Jan. 28 and performed scripted maneuvers intended to demonstrate the performance of redesigned divert thrusters on the missile warhead, the U.S. Missile Defense Agency (MDA) said. The test involved an Air Force C-17 air dropping a target representing an intermediate-range ballistic missile over the Pacific Ocean to the west of Hawaii. A radar at the Pacific Missile Range Facility in Hawaii tracked the target and relayed information back to a command and control system. A second radar on board a ship in the Pacific Ocean to the northeast of Hawaii also acquired and tracked the target, the MDA said. As the missile interceptor moved in for the kill, it started burning the alternate divert thrusters, deliberately running them until the fuel was exhausted. The test intentionally did not include an intercept. The MDA said data from the test will be used to improve the U.S. Ballistic Missile Defense System. The test came shortly before new satellite photos were published that showed renewed activity at North Korea’s Sohae launch site and speculation that the country is in the final stages of preparing for a rocket launch. In the last few years, the country has made several attempts to put satellites into space. Each time, the tests have drawn concern because the rocket technology is very similar to that used in intercontinental ballistic missiles and North Korea is banned from conducting such tests by U.N. Security Council resolutions.